It was finally time for our summer vacation to Block Island. I should have guessed it would be a Marine Science lesson in Environmental Protection. We were thrilled to be visiting an island so close to home. Sand, sun, and beaches! We couldn’t wait to explore this little paradise off the coast of New England. 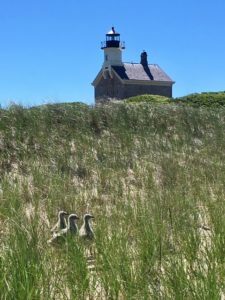 On our first day, we drove up to the Northeast Lighthouse and walked along the eastern shore to the tip of the island. We were the only people there. A storm had just passed and it was serene and beautiful. I was impressed with how clean the beach was. When we got to the northern end, we found a cluster of old mylar balloons. We picked it up as we rounded the tip and started walking back along the western shore. Then to our dismay, every 20 feet or so, we found more mylar balloons. The balloons came in every shape and size. They said “Congratulations Graduate,” “Happy Birthday,” “In Remembrance,” etc. They had all been released to celebrate some special occasion. They had floated for miles, burst, and then landed in the ocean to be collected by this tiny spit of land 12 miles off the coast. We picked them up as we found them. We couldn’t leave them there after watching Plastic Oceans. As we continued walking, we found a seagull rookery with hundreds of adult seagulls caring for young fluffy chicks the size of small chickens. The babies were hiding behind all of the trash. It broke my heart. We picked up balloons and plastic trash for 30 minutes. In that short time, we collected more than we could carry. As we walked back to our car, we passed people who looked horrified at the odd collection of trash in our hands. They all thanked us for picking up the balloons. We brought the trash back to our car and deposited them at a dumpster that a beach employee unlocked for us. He was shocked by all of the balloons we found – we were too. This is not a new problem. In 1990, we knew that releasing balloons is bad for all of us, but especially for marine wildlife. Unfortunately, people still have the “out of sight, out of mind” mentality. It is 27 years later, and people are still releasing balloons. Maybe if they could see the damage that balloons do, it would make them think of other alternatives. I can’t imagine that anyone would intend to kill seals, whales, dolphins, and sea turtles, but that is the likely outcome of the floating balloon. I just finished the 2016-17 school year with my Marine Science students. We learned about the work being done by local non-profits to promote and protect the marine environment. In my blog, Remember Why You Started And Press On, I highlighted all that we learned from the many organizations that are working to care for our rivers, seas, and oceans. One of the questions my students asked was “What do you think is the biggest problem facing the marine environment today?” Many of our guest speakers highlighted the serious threat of plastic and balloon pollution to marine wildlife. It’s a big problem. But, it’s not hard to be part of the solution. 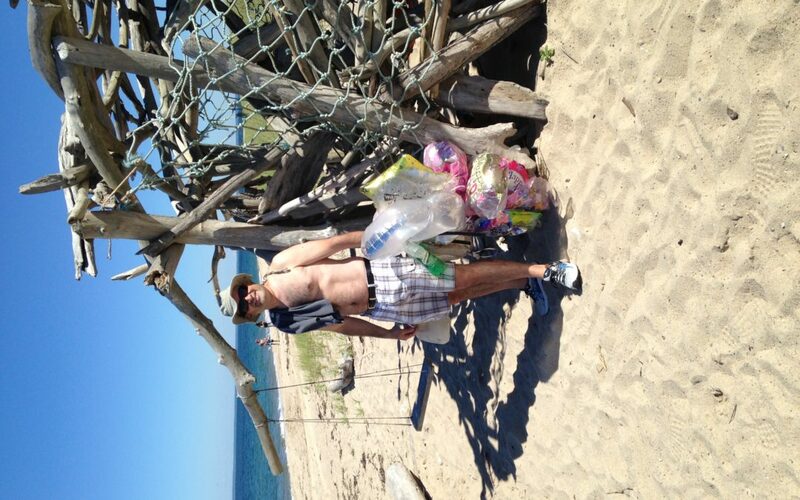 When you’re walking on the beach this summer, pick up any trash that you find. And, please encourage your family and friends to not release balloons. There are so many other ways to honor your loved ones.